The movie ‘Unplanned’ inspired more than 169 nationwide candlelight vigils, prayer, and protest services against Planned Parenthood on Saturday, April 13. ‘Unplanned’ depicts the true story of Abby Johnson, a former Planned Parenthood Director who becomes pro-life after watching a baby be aborted on an ultrasound screen. The Nationwide Pro-Life Vigils were coordinated by #ProtestPP, a joint project of the Pro-Life Action League, Created Equal, and Citizens for a Pro-Life Society. “When I read about it on LifeSite, I signed up and quickly began spreading the word,” said Connie Gonzales. “We have people here from Holy Innocents, Our Lady of the Desert, Holy Family, Nights of Columbus, a Lutheran church— all responding to the #ProtestPP.” Gonzales, from Hesperia, saw the information on Lifesitenews.com and signed up to be a local coordinator for the event. 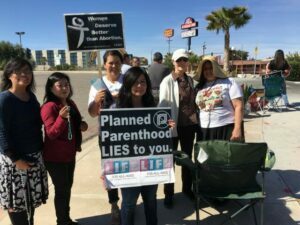 A steady flow of peaceful protestors stood outside holding signs and praying on the sidewalk near the driveway of The Victorville Health Center of Victorville which is operated by Planned Parenthood. “The women drive into the facility quickly and leave quickly,” said Gonzales. “We just stand outside to offer prayer. We are here for the children and representing the body of Christ. We need more people to stand together and network as one,” said Gonzales.